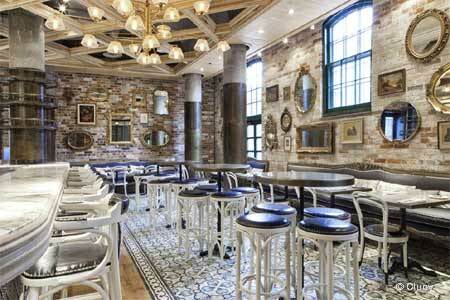 Elegant French bistro dining and striking bakery staples at this Distillery restaurant. : Luxuriously tiled floors and a ceiling with crown molding make Cluny Bistro & Boulangerie an elegant place to stop for weekend brunch or a special dinner. The menu presents French-inspired dishes and features a wealth of French ingredients including various cheeses and foie gras. A focal point of the dining room is the raw bar, which might have items like oysters or salmon tartare. Tuna tartare is prepared niçoise-style with green beans and olives, while the Moroccan-inspired chickpea and sweet potato tagine is sweet and spicy. Brunch is a busy affair with dishes like bourbon french toast and crab eggs Benedict, but unfortunately, inconsistencies do occur, such as an overly browned hot-smoked salmon omelet or an overcooked steak. The attached bakery is a highlight with its chocolate-almond breakfast pastry, very fresh and flaky, and olive sourdough, chewy with the perfect spider-cracked crust. Macaron come in a variety of flavours (pistachio, strawberry), but the lavender-cassis is special with its tangy and balanced tastes.